My friend who helped me with my book relaunch yesterday also referred me to some wonderful princess stories that Snowy Wings Publishing distributes. The first one I chose to read was Crown of Ice by Vicki Weavil because I was burnt out on Disney's Frozen and eager to read a more faithful adaptation of "The Snow Queen." Crown of Ice delivered exactly what I was hoping for. It gave me a new twist on a classic tale while still remaining true to the essence of the story. The characters were rich and full of life, and the book had lots of suspense on every page. Crown of Ice is the first book in a trilogy called The Mirror of Immortality. From what I've read so far, the trilogy is off to a very strong start. This book is told from the perspective of Thyra Winther, more commonly known as the Snow Queen. Instead of making her another trite misunderstood heroine, Thyra begins as an antihero who is fully aware that her intentions are not pure. She lies and manipulates shamelessly with the intention of preserving her own life. Yet, it is impossible to hate her. That is because in spite of all of her power, she is still a victim. The true villain of the story, Mael Voss, is a sorcerer who transforms innocent human girls into Snow Queens and forces them to assemble the shards of a broken mirror, a clever call-back to the original fairy tale. If a Snow Queen fails to perform her task in time, she is transformed into a wraith, a pitiful creature who loses her body and mind and feels only pain. Gerda and Kai, the main characters in the original "Snow Queen" also play a large role in this story. Since the Hans Christian Andersen version was told from Gerda's perspective, it makes sense that it would appear as though the Snow Queen seduced Kai to convince him to stay in her castle. In Crown of Ice, we learn that Kai was genuinely impressed by Thyra's ability to solve mathematical equations as well as he can. She finds his skills to be a great asset when it comes to piecing the mirror back together, which is why she brings him to the palace. If they can work together, she knows that she can solve the puzzle of the mirror in time. What makes Thyra work as the main character is that she isn't the evilest person in the book. The true villain is Mael Voss, who holds her captive along with countless other girls who have turned into wraiths and haunt the corridors of the palace in a way that reminds me of Ursula's garden from The Little Mermaid. As much as Thyra lies and manipulates to get what she wants, Mael Voss does so tenfold. In the end. Thyra's hatred for him is also part of her motivation to become a better person. Even though she wants to stop Gerda from taking Kai away from her before they fix the mirror, she has no desire to hurt her and adamantly protects her in whatever way she can. Since Thyra is more of a neutral character, Mael Voss's wickedness is balanced by a good sorceress named Sephia. Sephia came about from the old witch in the fairy tale who tried to keep Gerda living with her forever, using the flowers in her garden to hypnotize her to forget about Kai. It's interesting how this book takes the basics of each character from the fairy tale and expands on them to give them more depth. I loved that there was a good sorceress to counter the cold and deadly powers of the Snow Queen and Mael Voss. 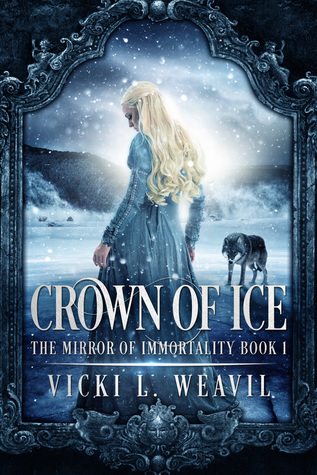 If you're looking for a strong adaptation of "The Snow Queen" that contains realistic characters and unexpected twists, look no further than Crown of Ice by Vicki Weavil. I enjoyed this book far more than I was expecting to. Even though Thyra Winther appears to be an evil queen at first, she soon blossoms into a good princess. Through it all, her motivations are completely understandable because no one would want to be a miserable wraith like the ones described in this book. I thoroughly enjoyed experiencing Thyra's story and loved that Gerda and Kai remained true to their essence from the fairy tale as well.